Plastic food storage containers should be checked for safety. 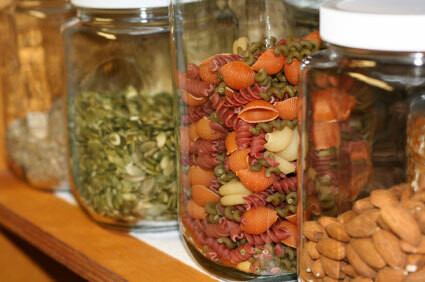 When it comes to plastic food storage, use either safe plastics or alternative materials. The topic of food storage falls into two categories – storing foods you have just bought, and storing foods you have already prepared. In the case of foods you have just bought, if they are packaged in plastic, check to make sure that it is a safe plastic. If not, open the packaging and transfer the food to a safer container. That container could be made from a safe plastic, or from some other material, like glass, ceramic or stainless steel. In fact, alternative storage containers are often lot more attractive to have in your kitchen, as well as being safer. If you have prepared a meal and want to store the leftovers, just be sure to store them in a container that isn’t going to leach harmful chemicals into the food. Again, if you are in the habit of storing leftovers in your fridge, be sure to get rid of the polystyrene and any other plastic that fall into the “bad plastic” category. Even if you are hooked on the convenience of plastic food storage containers with lids that flip on and off, you can now find these containers made from glass. And they still have a plastic lid that is easy to put on and take off.